Perfect for those with stressful lifestyles or insomnia, Weleda Lavender Relaxing Body Oil helps you to reach a calm state of mind. 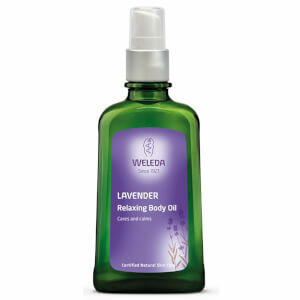 Organic lavender is combinded with sesame and sweet almond oils, which aid restful sleep. Rich in vitamins, antioxidants and fatty acids, the luxurious oil also supports the skin's natural regeneration processess and maintains hydration levels, leaving you with nourished, revitalised and radiant skin.